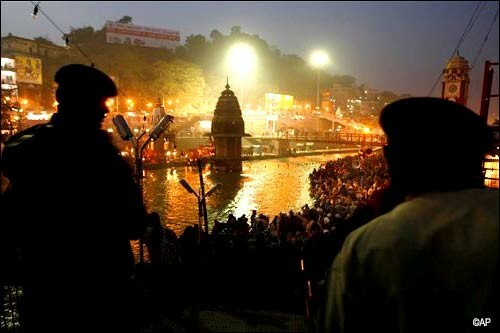 Haridwar, Jan 14: Millions have flocked to Haridwar on the banks of Ganga at the foot of Himalayas to join a three-month long festival which comes once in twelve years. Touted as the largest congregation, Kumbh Mela as it is called locally got underway with over 25 lakh people taking a dip in the Ganga on Thursday. The occasion was ‘Makar Sankranti’ — the day when the sun starts to move northwards marking the decline of winter and start of Uttarayan. The festival’s origins can be traced back to a Hindu myth which saw gods and demons fight over a pitcher. According to mythology, in the beginning of all creation, the gods were placed under a curse that made them weak and cowardly. Brahma, the creator god, advised them to retrieve the kumbh (pitcher) containing the nectar of immortality. The gods sought help from the demons and, together, they churned the primordial ocean to bring up the nectar. When Dhanwantari, the divine healer, appeared with the kumbh containing the nectar, a great fight over the pitcher ensued between the gods and the demons, and the gods eventually won. 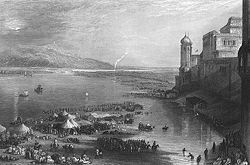 During the fierce battle in the sky, a few drops of nectar fell in four different places: Allahabad, in the state of Uttar Pradesh, which sees the confluence of the rivers Ganga (Ganges), Yamuna and Saraswati; Haridwar in Uttar Pradesh, where the Ganga enters the plains from the Himalayas; Ujjain in Madhya Pradesh which lies on the banks of the Ksipra river; and Nasik in Maharashtra, which is on the banks of the Godavari River. The Kumbh Mela alternates between these four places and takes place every three years. Once every 12 years, a grand Maha Kumbh Mela is held. The next will be in Allahabad in 2013.